Hotline for Refugees and Migrants | Eritrea: A Dictatorship Nearing Collapse? Eritrea: A Dictatorship Nearing Collapse? Israel is home to about 35,000 Eritrean asylum-seekers. While the Israeli government claims that they are work migrants, so as not to violate its own laws, Israel does not forcibly deport Eritreans back to their country of origin. As long as Eritrea is ruled by the current regime, the millions of Eritreans living outside of their homeland cannot return, but is it possible that the regime in Eritrea will soon collapse? Recent reports from Eritrea and refugees who lately fled the east-African country indicate that the regime is struggling to maintain its control over the population. The regime relies on repression, its most extreme fashion being the open-ended national service, to scare the population into submission. At the same time, revenues from mining, nearly free slave labor and taxes Eritreans abroad are forced to pay, allow the regime to sustain itself economically. In recent years, however, these pillars of regime’s stability have begun to crack. The national service in Eritrea starts in the 11th grade and ends when the person is no longer capable of performing his/her service, usually around the age of 50. Eritreans who fought in Eritrea’s war of independence from Ethiopia (which ended in 1991), for example, are still mobilized. The 400,000-strong military and national service force makes up about 10% of the population. The servicemen and women are rarely involved in military-related activity, as Eritrea hasn’t fought a war since 2001. Instead, according the UN Special Rapporteur on Eritrea, the servicemen and women carry out “manual labour on agricultural farms or construction sites… A large number of draftees… work in civilian administration, infrastructure projects, education and construction.” The International Crisis Group (ICG), a think-tank, adds: “national service is used as a source of free, forced labour for ‘parastatal’ farms or companies directly in the hands of individual generals.” Since most of the duties performed by Eritrean draftees has nothing to do with military service and the service is open-ended, The International Labor Organization has labeled the national service in Eritrea as forced labor, which is prohibited under numerous ILO conventions that Eritrea has ratified. Due to the endless nature of the national service and the perpetual fear of being subjected to abuse, thousands defect from national service every month. According to UN statistics, about 4,000 Eritreans fled their homeland every month in the first six months of 2014, doubling the number of people fleeing the country compared to 2013. According to Eritrean-Swedish activist, Meron Estefanos, since September 2014, the average number of Eritreans arriving in Ethiopia daily has reached 200, meaning, about 6,000 people flee to Ethiopia each month alone (while many others flee to Sudan). Many of the refugees are unaccompanied minors who flee forced drafts. This process “has started to deplete entire villages”. Eritreans are fleeing despite the regime’s draconian policies to stymie the exodus – a policy of shoot-to-kill at the border, detention and torture of those caught attempting escape, and even of Eritreans suspected of “plotting to leave the country”. The conditions in detention are life-threatening the the detainees are not provided with enough food. Relatives of people who successfully escape the country are forced to pay a high fine (50,000 Nakfa) or face detention themselves. In addition, Eritreans deported to their country of origin after illegally leaving it “face torture, detention and disappearance in Eritrea”, according to the UN Special Rapporteur on Eritrea. Due to the shortage in slave labor, the military police goes on routine forced-conscription round-ups (“giffas” in Tigrinya), during which anyone who appears healthy enough to serve is forcibly taken, including children under the age of 18. Those who resist being taken are at times executed on the spot. The regime resorts to these round-ups because many Eritreans simply don’t show up for the obligatory service and must be physically compelled to perform it. According to activists in Eritrea, only 50 of the 400 Eritreans who were recently granted a short leave to see their families returned to service. According to Meron Estefanos, the regime recently began calling up men over 50 for military training, due to the manpower shortage. Very few men showed up, forcing the regime to issue a second call. The salaries of national servicemen is about $10 per month, precluding servicemen and women from supporting their families throughout their service. As a result, families of servicemen struggle to survive, while the cost of basic staples of food, gasoline and rent keeps rising. The impoverished regime, at the same time, cannot provide its citizen with even the basic services of water and electricity, which are recurrently cut for several hours every day. As one Eritrean described it to The Guardian: “Essentials like water, electricity or petrol have disappeared” and even middle-class families struggle to find food. As a result, “many Eritreans rely on informal work to feed their families.” Soldiers at border crossings, for example, demand up to $1,000 to smuggle people safely out of the country. The militarism and discipline that characterized the years of the war of independence against Ethiopia are no longer necessary, but the regime is attempting to keep them alive to preserve its rule. After independence, Eritrea’s revolutionary-leader-turned-dictator, Isaias Afawerki, instituted mandatory national service, “the official aim was to inculcate the younger generation with the spirit of the liberation struggle, but the impact was to cow society”, writes the ICG. The indefinite military service, institutionalized under the Wefri Warsai Yika’alo development campaign, “serves the dual purpose of eliminating dissent and reinforcing the army, which has become increasingly necessary for maintaining power,” writes the ICG. “The result is overwhelming militarization of an already authoritarian regime… Therefore, the military plays a leading role in coercing and intimidating the population.” To justify not demobilizing an army that makes up 10 percent of the population while there is no war, “Isaias played on the general animosity between states in the region to promote the idea that Eritrea is surrounded by enemies,” according to the ICG. But this ideology of paranoia and militarization is losing adherents – thousands of Eritreans abandon their service every month, tired of slaving away for years while being subjected to constant abuse. Ethiopia, the major ‘enemy’ justifying the general mobilization, is home to about 100,000 Eritrean refugees. No wonder then that when the Ethiopian military made incursions into Eritrean territory in 2012, it was met with little resistance. That same year, the Information Minister, once deemed ultra-loyal to Afawerki, defected and fled the country. 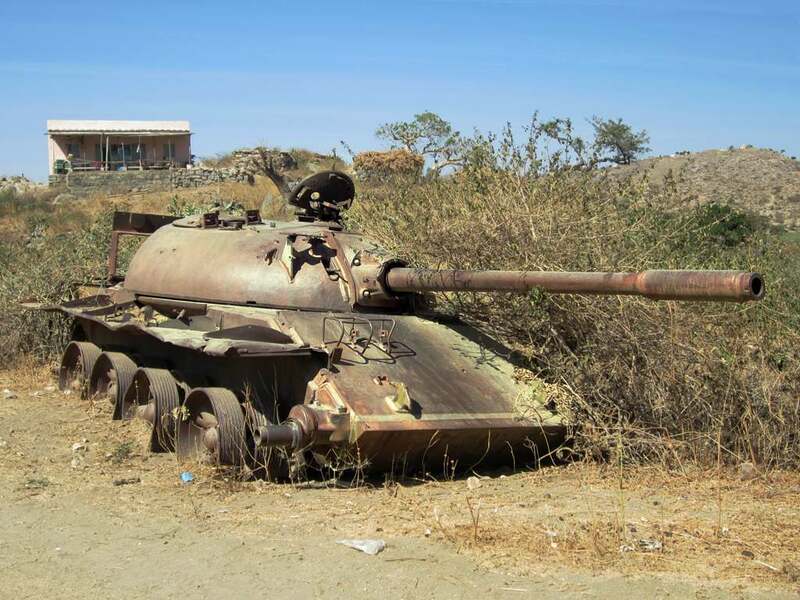 In January 2013, a group of soldiers voiced their opposition to the regime by taking over “Forto”, the building of the Eritrean information ministry. The soldiers forced the station’s director to read a statement on air calling for the release of political detainees and for the implementation of the 1997 constitution. The crisis ended with the soldiers retreating to their barracks. Following the incident, the regime carried out several rounds of arrests of political and military figures. In 2013, rumors circulated in Eritrea that numerous generals and lower-ranking officers were dismissed or neutralized, as Afawerki attempts to prevent any challenges to his rule. As the Eritrean military grows weaker and is seen as unreliable by Afawerki, he began relying on a 20,000-strong force of Ethiopian guerrillas (TPDM) who are based in Eritrea to police the population, which is resentful of the foreign force. 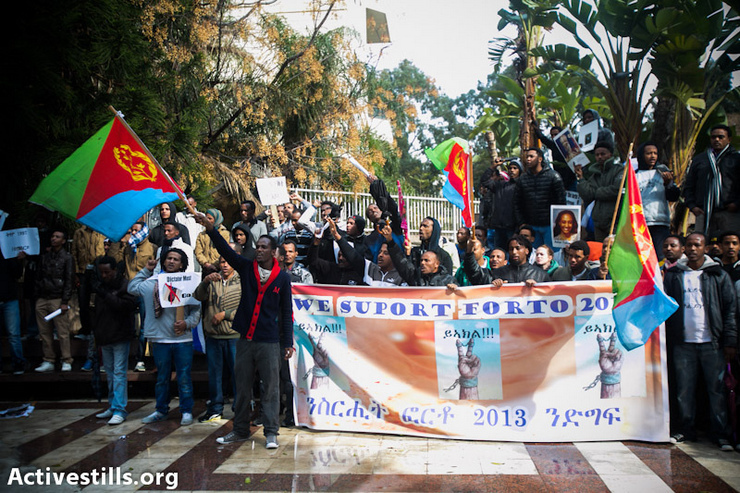 Eritrean activists outside of the country launched the “Freedom Friday” movement two years ago. The activists would randomly call Eritrean landline numbers and urge people to stay at home that day to quietly voice their opposition this way. Since then, the underground movement in Eritrea has grown, with activists now pasting posters on walls in Eritrea, calling for protests against the regime. The public discourse in Eritrea is also apparently changing, with citizens openly criticizing the regime in public spaces.